A logarithmic chart of the S&P 500 using daily closing values from January 3, 1950 to February 19, 2016. The S&P 500, or just the S&P, is an American stock market index based on the market capitalizations of 500 large companies having common stock listed on the NYSE, NASDAQ, or the Cboe BZX Exchange. The S&P 500 was developed and continues to be maintained by S&P Dow Jones Indices, a joint venture majority-owned by S&P Global. S&P Dow Jones Indices publishes many stock market indices such as the Dow Jones Industrial Average, S&P MidCap 400, the S&P SmallCap 600, and the S&P Composite 1500. David M. Blitzer leads the committee that has overall responsibility for index security selection. The S&P 500 is a capitalization-weighted index, and is associated with many ticker symbols, such as: ^GSPC, INX,, SPY and $SPX, depending on market or website. The S&P 500 differs from the Dow Jones Industrial Average (although it includes all 30 companies of the DJIA) and the NASDAQ Composite index, because of its diverse constituency and weighting methodology. It is one of the most commonly followed equity indices, and many consider it one of the best representations of the U.S. stock market. Standard & Poor's, a company that provides financial information and analysis, was founded in 1860 by Henry Varnum Poor. The "Composite Index", as the S&P 500 was first called when it introduced its first stock index in 1923, began tracking a small number of stocks. Three years later in 1926, the Composite Index expanded to 90 stocks and then in 1957 it expanded to its current 500. In 1941, Poor's Publishing (Henry Varnum Poor's original company) merged with Standard Statistics (founded in 1906 as the Standard Statistics Bureau) and therein assumed the name Standard and Poor's Corporation. Its primary daily stock market index was the "S&P 90", a value-weighted index based on 90 stocks. Standard & Poor's also published a weekly index of the stocks of 425 industrial companies. The S&P 500 index in its present form began on March 4, 1957. Technology has allowed the index to be calculated and disseminated in real time. The S&P 500 is widely used as a measure of the general level of stock prices, as it includes both growth stocks and value stocks. In September 1962, Ultronic Systems Corp. entered into an agreement with Standard and Poor's. Under the terms of this agreement, Ultronics computed the S&P 500 Stock Composite Index, the 425 Stock Industrial Index, the 50 Stock Utility Index, and the 25 Stock Rail Index. Throughout the market day these statistics were furnished to Standard & Poor's. In addition, Ultronics also computed and reported the 94 S&P sub-indexes. On August 12, 1982, the index closed at 102.42. The following describes the ups and downs of the period year 2000 to date. 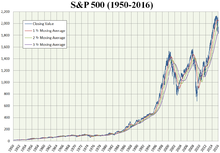 On March 24, 2000, the index reached an intraday high of 1,552.87, at the peak of the dot-com bubble; a high not to be exceeded for the following seven years. By October 10, 2002, the index had fallen to 768.83, a decline of approximately 50%, during the stock market downturn of 2002 ; before subsequently turning back up. On May 30, 2007, the S&P 500 closed at 1,530.23, to set its first all-time closing high in more than seven years. Although the index achieved a new all-time intraday high on October 11, 2007, at 1,576.09, following a record close of 1,565.15 on October 9, the index finished 2007 at 1,468.36 points—just below its 1999 annual close. Less than a month later, it dropped to 1,400, and would not see similar levels again for five years. In mid-2007, the subprime mortgage crisis spread to the wider U.S. financial sector. The resulting situation became acute in September 2008, ushering in a period of unusual market volatility, encompassing record 100-point swings in both directions and reaching the highest levels since 1929. On November 20, 2008, the index closed at 752.44, its lowest since early 1997. A modest recovery the following day still left the index down 45.5% for the year. This year-to-date loss was the greatest since 1931, when the broad market declined more than 50%. The index closed the year at 903.25, for a loss of 38.5%. The market continued to decline in early 2009, surrounding the financial crisis of 2008. The index reached a nearly 13-year low, closing at 676.53, on March 9, 2009. The entire drop from high in Oct 2007 to low in Mar 2009 was 57.7%, the largest since WWII. On March 23, 2009, the S&P 500 marked a 20% gain when it hit 822.92. The Dow Jones Industrial Average soon followed. The close for 2009 was 1,115.10, making it the second-best year of the decade. On April 14, 2010 the index broke 1,200 closing at 1,210.65, but by July 2, 2010 it had closed at 1022.58. On April 29, 2011, the index closed at 1,363.61, but it had a sharp drop in August and briefly broke 1,100 in October (with the VIX hitting 40). Gains continued despite significant volatility amid electoral and fiscal uncertainty, and the 2012 close of the S&P 500 following QE3 was its third-highest ever, at 1,426.22 points. On March 28, 2013, it closed above the closing high from 2007. On April 10, 2013, it also closed above the intraday high from 2007. A period of over a year with no new record highs ended on July 11, 2016 (closing at 2,137.16). In June 2017, the index saw the largest weekly rise since the past presidential election in November 2016. Rapid growth in the S&P 500 and the Dow Jones as well in late 2017 translated to nasty declines in early 2018. A few months later, the S&P 500 fell borderline between correction territory (closing-basis) and bear market territory (intraday-basis). Nonetheless, the index rallied significantly to exit either of the two, but some argued a new high had to be made before that can happen. The committee selects the companies in the S&P 500 so they are representative of the industries in the United States economy. The securities must be publicly listed on either the NYSE (including NYSE Arca or NYSE MKT) or NASDAQ (NASDAQ Global Select Market, NASDAQ Select Market or the NASDAQ Capital Market). Securities that are ineligible for inclusion in the index are limited partnerships, master limited partnerships, OTC bulletin board issues, closed-end funds, ETFs, ETNs, royalty trusts, tracking stocks, preferred stock, unit trusts, equity warrants, convertible bonds, investment trusts, ADRs, ADSs and MLP IT units. The index includes non-U.S. companies, both formerly U.S.-incorporated companies that have re-incorporated outside the United States, as well as firms that have never been incorporated in the United States. The "S&P 500" generally quoted is a price return index; there are also "total return" and "net total return" versions of the index. These versions differ in how dividends are accounted for. The price return version does not account for dividends; it only captures the changes in the prices of the index components. The total return version reflects the effects of dividend reinvestment. Finally, the net total return version reflects the effects of dividend reinvestment after the deduction of withholding tax. Standard & Poor's now calculates the market capitalization of each company relevant to the index using only the number of shares available for public trading (called the "float"). The index has traditionally been capitalization-weighted; that is, movements in the prices of stocks with higher market capitalizations (the share price times the number of shares outstanding) had a greater impact on the value of the index than do companies with smaller market caps. The transition to float-adjusted capitalization-weighting was made in two steps, the first on March 18, 2005 and the second on September 16, 2005. In order to keep the S&P 500 Index consistent over time, it is adjusted to capture corporate actions which affect market capitalization, such as additional share issuance, dividends and restructuring events such as mergers or spin-offs. Additionally, to remain indicative of the U.S. stock market, the constituent stocks are changed from time to time. To calculate the value of the S&P 500 Index, the sum of the adjusted market capitalization of all 500 stocks is divided by a factor, usually referred to as the Divisor. For example, if the total adjusted market cap of the 500 component stocks is US$13 trillion and the Divisor is set at 8.933 billion, then the S&P 500 Index value would be 1,455.28. Although the adjusted market capitalization of the entire index can be accessed from Standard & Poor's website, the Divisor is considered to be proprietary to the firm. However, the Divisor's value is approximately 8.9 billion. where P is the price of each stock in the index and Q is the number of shares publicly available for each stock. The divisor is adjusted in the case of stock issuance, spin-offs or similar structural changes, to ensure that such events do not in themselves alter the numerical value of the Index. The index value is updated every 15 seconds during trading sessions and is disseminated by Reuters America, Inc., a subsidiary of Thomson Reuters Corporation. Many index funds and exchange-traded funds attempt to replicate (before fees and expenses) the performance of the S&P 500 by holding the same stocks as the index, in the same proportions. Many other mutual funds are benchmarked to the S&P 500. Consequently, a company whose stock is added to the list of S&P 500 stocks may see its stock price rise, as index funds must purchase that company's stock in order to continue tracking the S&P 500 index. Mutual fund managers provide index funds that track the S&P 500, the first of which was The Vanguard Group's Vanguard 500 in 1976. SPY, a unit investment trust, is the oldest and largest ETF as of 2018, while other notable funds include IVV and VOO. In addition to investing in a mutual fund indexed to the S&P 500, investors may also purchase shares of an exchange-traded fund (ETF) which represents ownership in a portfolio of the equity securities that comprise the Standard & Poor's 500 Index. These exchange-traded funds track the S&P 500 index and may be used to trade the index. Investors may also invest in all the stocks of the S&P 500 directly, which is usually called index replication. In the derivatives market, the Chicago Mercantile Exchange (CME) offers futures contracts (ticker symbols /SP for the full-sized contract and /ES for the E-mini contract that is one-fifth the size of /SP) that track the index and trade on the exchange floor in an open outcry auction, or on CME's Globex platform, and are the exchange's most popular product. Additionally, the Chicago Board Options Exchange (CBOE) offers options on the S&P 500 as well as S&P 500 ETFs, inverse ETFs and leveraged ETFs. On October 11, 2007, S&P index set a milestone with its all-time intraday high of 1,576.09. On March 28, 2013, the S&P finally surpassed its closing high level of 1,565.15, recovering all its losses from the financial crisis. On March 2, 2015, the S&P finally closed at a new all-time inflation-adjusted closing high, though it has yet to achieve a new all-time inflation-adjusted intraday high, both of which were set back in 2000. (total return) The CAGR (Compound Annual Growth Rate, Annualized Return) is the best average rate to summarize investment returns over several years. In contrast with the median return or the mean return, the CAGR is the measurement of the actual return achieved over the number of years being studied. ^ "S&P 500 factsheet" (PDF). Standard & Poor's. Retrieved January 20, 2013. ^ a b "S&P 500 Overview". S&P/Dow Jones Indices LLC. Retrieved January 20, 2013. ^ "S&P Dow Jones Indices Announces Treatment of Stock Dividend for Discovery Communications in S&P 500" (PDF). Spice-indices.com. Retrieved December 16, 2017. ^ "Dow Jones Indices" (PDF). Us.spindices.com. Retrieved December 16, 2017. ^ a b c d e f "S&P U.S. Indices Methodology" (PDF). Standard & Poor's. Retrieved December 16, 2017. ^ "S&P 500®". S&P Dow Jones Indices. ^ Reklaitis, Victor (October 30, 2015). "The S&P is up 9% this month, but these 10 stocks jumped more than 22%". Marketwatch.com. ^ "The S&P is Flat for the Year, and that Usually Leads to Huge Moves". Dailyfx.com. December 28, 2015. ^ Ferri, Rick (December 19, 2013). "An Interview With S&P Dow Jones Index Chief David Blitzer". Forbes. Retrieved May 19, 2018. ^ "Yahoo! Finance: ^GSPC". Yahoo!. ^ "Google Finance: .INX". Google. ^ Olson, Sheila. "Top 3 ETFs to Track the S&P 500 as of October 2018". Investopedia. Retrieved March 24, 2019. ^ "S&P 500 Index Quote". MarketWatch. Retrieved February 9, 2016. ^ "Standard & Poor's 500 Index – S&P 500". Investopedia.com. Retrieved June 11, 2012. ^ a b "S&P 500 – stock market". britannica.com. ^ "Penn State WebAccess Secure Login:". Ezaccess.libraries.psu.edu. Retrieved December 16, 2017. ^ Obienugh, J.P. (2010). Jonbull’s Stock Guide: How to Invest Profitably in a Volatile Stock Market. Victoria, BC, Canada: Trafford Publishing. p. 156. ISBN 978-1-4269-2664-8. ^ Marotta, D. J., "Volker's Bear: The Bear Market Of 1982", Forbes, Oct 11, 2017. ^ "New High For S&P 500". ETF.com. August 9, 2007. ^ "S&P 500 actual volatility at highest since 1929". FinanzNachrichten.de. November 21, 2008. Retrieved May 27, 2015. ^ Perman, Cindy (November 20, 2008). "Stocks Plunge, Leaving Dow Below 7600". CNBC. ^ Sommer, Jeff (November 23, 2008). "A Friday Rally Can't Save the Week". The New York Times. ^ Twin, Alexandra (December 31, 2008). "Wall Street: Bring on '09". Market Report. CNNMoney. ^ "U.S. Stocks Jump, Capping S&P 500's Best 10-Day Gain Since 1938". Bloomberg.com. Retrieved May 27, 2015. ^ Peter Mckay, Geoffrey Rogow and Rob Curran (March 26, 2009). "Stocks' Momentum Keeps Building". The Wall Street Journal. Retrieved April 4, 2013. ^ "Wall St closes out '09 with best gains since 2003". Reuters. December 31, 2009. Retrieved December 16, 2017. ^ "S&P 500 Closes At All-Time High". The Huffington Post. Retrieved May 27, 2015. ^ Maureen Farrell (April 10, 2013). "Dow and S&P 500 close at new record highs". CNNMoney. Retrieved May 27, 2015. ^ Reuters (July 11, 2016). Strong economy, earnings bets propel S&P 500 to record high. ^ Gold, Riva; Driebusch, Corrie (June 24, 2017). "U.S. Stocks Notch Weekly Gains". Wsj.com. Retrieved December 16, 2017. ^ DeCambre, Mark. "Dow and S&P 500 escape correction territory after 5-day stock-market surge". MarketWatch. Retrieved March 20, 2019. ^ "S&P – Indices > Equity Indices – S&P 500 – Index Table". standardandpoors.com. ^ "Standard & Poor's Announces Changes to U.S. Investable Weight Factors and Final Float Transition Schedule". PRNewswire. March 9, 2005. Retrieved January 20, 2013. ^ a b c "S&P Indices Index Mathematics Methodology" (PDF). The McGraw-Hill Companies, Inc. Archived from the original (PDF) on November 6, 2011. Retrieved January 20, 2013. ^ "S&P Dow Jones Index Mathematics Methodology" (PDF). Spindices.com. March 2014. p. 6. Retrieved December 16, 2017. ^ "S&P 500 Details". Standard & Poor's. Retrieved January 20, 2013. ^ "How is the value of the S&P 500 calculated?". Investopedia.com. Retrieved January 20, 2013. ^ "Investopedia Vanguard Profile". Investopedia.com. Retrieved December 16, 2017. ^ a b Park, JeeYeon. "Record-Smashing Quarter: S&P 500 Ends Above 2007's Record Close, Dow Posts Best Q1 Since 1998". CNBC.com Writer. Retrieved March 28, 2013. ^ "CPI Inflation Calculator". Data.bls.gov. Retrieved September 13, 2015.